We've been starting some of the chillier mornings this past week in front of our fireplace, and hot cocoa is finding its way back into our daily routine. It makes me happy in a way that only the smallest of details of the changing seasons can; an influx of plaid in the catalogs in my mailbox, adding an extra blanket at night, bringing our fall books out of storage. It's the little things like this that I look forward to, even more than the bigger and more obvious "Halloween!" "Thanksgiving!" declarations. Here are a few of my favorite cozy ways to add that something extra to your fall. They're the sort of thing you might not miss terribly if you don't have, but become the sort of details you always remember. I walked into Target today and saw the coziest flannel sheets and I intend to buy a set for every bed in my house. They have a huge selection, and a plaid that is to die for. The plaid is sold out online (I couldn't even get a picture of it! ), but the set above is similar. I know my kids would go crazy for the puppy ones. I keep holiday and seasonal books packed away in the off-months. I feel like it makes them that much more special to curl up and read together. I could post an entire library and still be looking for more. I'd love to hear your favorites. 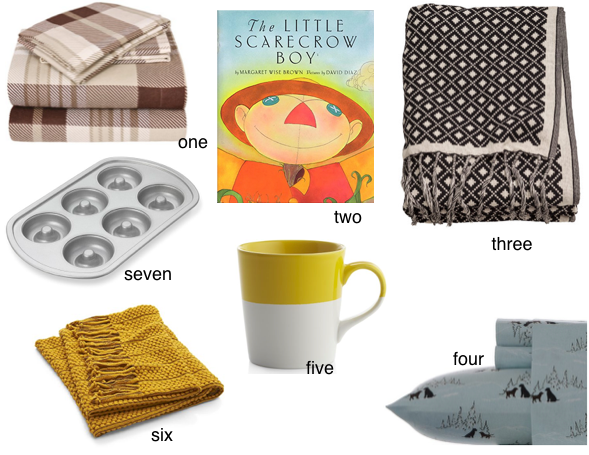 Whether it's to wrap up in by the fire, keep handy at breakfast like my kids do, or just to keep on your lap when you sit on the couch, a good throw blanket is a fall staple. Grab one in an autumn hue to toss on your couch, and you've pretty much just decorated for the season. Or maybe that's just the minimalist in me. I linked to the gold throw, but it comes in a few more colors that I like just as much. Also, Target has options for less than $16. In the cooler months, I feel like I do entire loads of dishes that consist only of mugs. Monogrammed ones are my favorite, but I might have to branch out to something I'm less attached to. You know, children and breakables and all. By baking essentials, I do mean donuts. A warm donut complements a dreary day perfectly. Or you could package some up and take them to a neighbor, if you're into sharing. See more fall prep here and here.